Heat the oven to 350°F. Lightly brush both sides of the bread slices with the oil. Press the bread slices into the bottom and up the sides of 4 (2 1/2-inch) muffin-pan cups. Bake for 10 minutes or until the bread cups are lightly browned. Remove the bread cups from the pan and let cool completely on a wire rack. Place the lettuce into a medium bowl. Add the dressing and toss to coat. 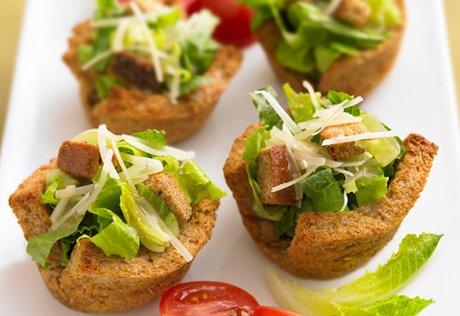 Spoon 1 cup lettuce mixture into each bread cup. Sprinkle with the croutons and cheese.